Death is a sad but inevitable part of life and the last thing you want to do at this time is spend time in the kitchen. Chutzpah Deli’s Shiva catering takes the burden of feeding large numbers of guests off your hands so that you can focus on hosting. Shiva, the 7-day Jewish mourning period, is a gathering of friends and families of the bereaved to mourn death and share meals as they celebrate the life of the dearly departed. Food has a way of bringing people together and being as it is a sad time, you may not have enough time to cook. Chutzpah caters to these events, preparing biting ideal for the occasion and delivering it in time, regardless of the number of guests. Being as mourners could be from different parts of the world, we recommend that orders be placed before 3PM on the day prior to delivery, so the staff has enough time to prepare a great meal. We have several options to order from, including our special over-stuffed sandwiches. Among the dishes you will love from Chutzpah are jumbo shrimp salad, Hebrew National Bologna, roast beef, salsalito spicy turkey, smoked lean pastrami, and cured corn beef. We serve them in bite sizes depending on your taste and to fit the ceremony. We have specialty sandwiches too – Bucko 46, Chutzpah cheesesteak, Bubba’s Famous, and the Luca Brasi among others. We cater to groups of 10 and above and deliver to your doorstep in the agreed time. The pastries corner is even better and will go perfectly with Shiva, thanks to the bite-size servings that are easy to serve and share. Apple pastry, Ruglach, carrot cake, Chocolate Babka, lemon bars, Marzipan, and chocolate grahams are among the delicacies you can order from this corner. We respect your occasions and so any meal you order is going to be delivered in good time. For groups of 10 people and above, we request that you place those orders well in advance to allow us time to prepare the meal. You can either call us to place your order or do it online and we will be at your doorstep at the agreed time. We are open seven days of the week until night to give you enough time to place your orders or walk in for a meal after work. Our friendly and witty staff will help you choose a meal if you need any help and recommend dessert options. Chutzpah has a kiddie menu too, so you can bring them along for a family dining experience. You can pay in cash, personal and corporate checks, and credits cards too. The restaurant makes special arrangements with companies so they can pay through a corporate account. 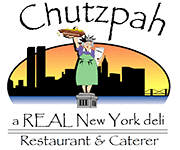 Chutzpah has friendly service, authentic New York food, delivery services that actually work, and a wide menu from which to choose. For your Shiva catering and other needs, contact the management. I would recommend it to anyone looking for a deli sandwich.First time I had a pastrami sandwich which was huge and delicious.This time I had a Combo Reuben on Rye. The food was very good!!!!! Comparable to what I call The NY Heavyweight Katz’s, Carnegie, 2nd Ave Deli, Epstein’s, and Bens. Chutzpah is my favorite local deli. I regularly check Chutzpah's website and Facebook page for their breakfast, lunch, and dinner specials. Have Questions About Shiva Catering?